This form is a purchase agreement for the all cash acquisition of an online community forum website, the domain names utilized for the site, and the associated code and software for the site. The agreement contemplates a cash sale using an escrow set up with escrow.com. No liabilities associated with the website or transferred domain names are assumed by the buyer. 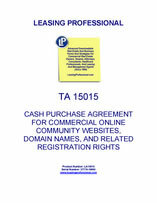 The form contains a further assurances clause obligating the seller to execute and deliver to buyer any new or confirmatory instruments and do and perform (at buyer's reasonable expense) any other acts which buyer may reasonably request in order to fully sell assign and transfer to and vest in buyer, all of seller's right, title and interest in and to the website including domain names, software, databases, images, trademarks and hosting agreements. The agreement contains a list of seller warranties and representations in connection with the sale including warranties of authority to enter into the transaction, that the seller has good title to the transferred assets, and that prior financial information furnished to the buyer is correct, among others.